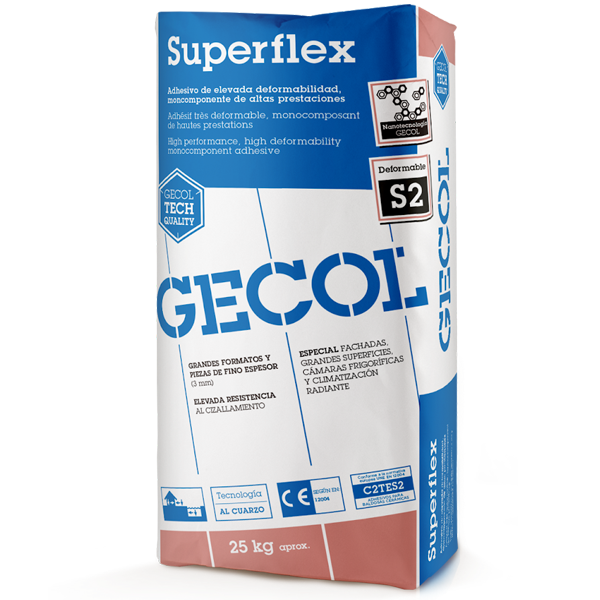 GECOL Superflex is a state-of-the-art, highly-deformable one-component cement adhesive. It is suitable for the installation of all types of ceramic tiles (with or without absorption), marble, granite and natural or reconstituted stone. Its high level of resistance to shearing, wetting and deformability means that it is especially recommended for the installation of large-format pieces and flooring with low thickness (3mm). It is extensively used in interiors, exteriors and facade coverings on cement mortar, concrete surfaces, etc. Its composition makes it suitable for the installation of stoneware on antique ceramic tiled floors, without the need for the previous application of a coat of bonding primer. It is also suitable for flooring used for public, commercial and industrial purposes and street furniture subjected to very sudden temperature changes (heat and frost), sloping or uneven surfaces and flooring with underground heating or cooling systems.